Numerous reports suggest that the Senate, lacking the votes to pass either the Better Care Reconciliation Act or a straight repeal of Obamacare, will vote on a so-called “skinny repeal” of the Affordable Care Act on Tuesday afternoon. The “skinny repeal” would likely end the ACA’s mandate that individuals buy insurance and perhaps even eliminate some taxes on the insurance industry. It’s unclear whether or not Mitch McConnell has enough votes to pass the 2015 version of Obamacare repeal—Senator Rand Paul said he would vote for that repeal and Senator John McCain will return to Senate this afternoon to cast his vote. If McConnell doesn’t have the votes, it’s likely that after the vote on the 2015 repeal, the Senate will then vote on the BCRA with both the Cruz amendment and the Portman amendment attached. The Cruz amendment would essentially allow insurers to opt-out of the essential health benefits required by Obamacare or offer unregulated, cheaper plans. The other amendment, added by Ohio Senator Rob Portman, increases spending on Medicaid and will also be considered. What is clear is that the BCRA doesn’t have the votes to pass. Because of Senate rules, the Cruz amendment, the Portman amendment, as well as a number of key provisions in the BCRA, need 60 votes to pass. McConnell doesn’t have 60 votes. If the Senate is unable to pass the 2015 version of Obamacare repeal, it’s likely to move on to the “skinny repeal” option: removing the mandate. Though passing the “skinny repeal” would give Republicans a political win of sorts, Vox notes that the “policy could prove extremely disruptive to the individual insurance markets.” Essentially, removing the mandate could discourage healthy individuals from buying insurance in the Obamacare marketplaces, thus “putting the individual insurance market at risk of spinning into a death spiral if Senate and House lawmakers can’t reach an agreement on a final piece of legislation.” According to one estimate, the “skinny repeal” could result in higher premiums and leave 15 million more Americans uninsured. We will update this post as the Senate moves forward at 2:15 this afternoon. Update, 2:20 p.m.: Senators Heller and Capito said they will vote “yes” to on the motion to proceed. 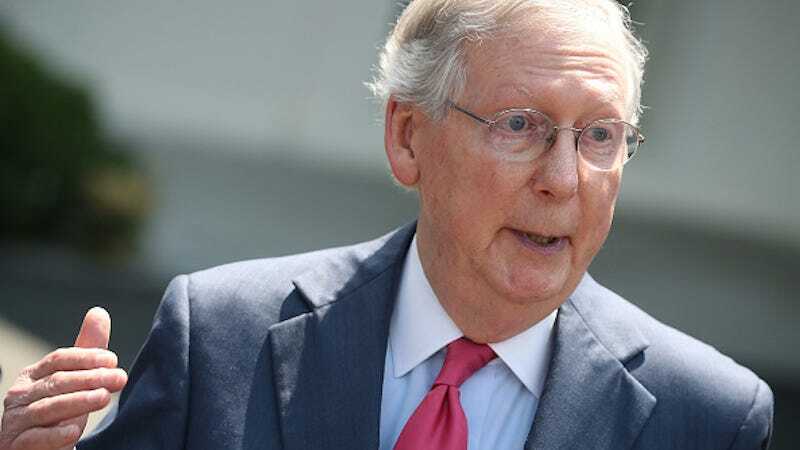 Update, 2:30 p.m.: In an address to the Senate prior to voting on the motion to proceed, Mitch McConnell urged Republicans to have the “courage to begin the debate.” “We can’t watch this moment slip by,” he said, adding that “we’ve watched the consequences of the status quo.” “The people who sent us here...expect us to tackle the big problems. We can’t get an outcome if we don’t start the debate. That’s what the motion to proceed is all about,” McConnell said. He closed by moving for the vote on the motion to proceed. McConnell’s motion was interrupted by a group chanting “Kill the bill, don’t kill us” and “shame.” They were removed from the chamber but could be heard in the background as the vote began. Update, 2:45 p.m.: Senators Collins and Murkowski are the only two Republicans to vote “no” on the motion to proceed. The Senate is waiting for Senators Ron Johnson and John McCain to cast their votes. Update, 3:05 p.m.: John McCain enters to a standing ovation. McCain and Johnson vote “yes.” Republicans have 50 votes to begin the motion to proceed with Vice President Mike Pence expected to cast the tie-breaking vote. As expected, all Democrats voted “no.” It is unclear what will come next. Update, 3:10 p.m.: As expected, Mike Pence voted “yes” on the motion to proceed. Update, 3:25 p.m.: John McCain address the Senate, offering a plea for bipartisanship. “Our responsibilities are vitally important to the continued success of the Republic,” he said. The Senate’s “principled mindset...comes to mind when I hear the Senate referred to as the world’s greatest deliberative body. I’m not sure we can claim that with a straight face, today,” McCain said to his colleague. He chastised the Senate on the “partisan...tribal” divisions of the chamber. “I will not vote for this bill as it is today. It’s a shell of a bill, we all know that,” McCain said, failing to indicate which bills he will vote against. Update, 4:00 p.m.: The Senate has moved to 20 hours of debate for the next three days. Update, 9:45 p.m.: The Senate debated and voted on amendments to the Better Care Reconciliation Act. The vote was not on the BCRA itself but on whether or not the Cruz amendment met the Senate’s rules. That vote fell short of the necessary 60 votes. Eight Republicans voted no. This doesn’t mean that the BCRA is technically dead but it does mean that the bill would need to undergo major revisions before it can pass the Senate.